This year, the Fairbanks Curling Club will host the 2011 Junior Nationals, a competition for youth teams. If you’ve never heard of curling or know nothing about it, you aren’t alone. People usually associate curling as something you do to your hair or in the weight room. 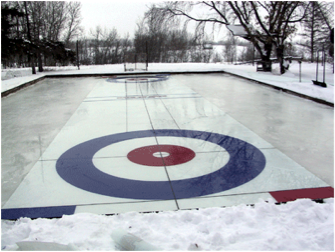 However, curling has been around for quite a while and has gained increasing popularity in the last decade or so. If the zany uniforms and calculated sweeping techniques didn’t hook you during the last winter Olympics, there is plenty of opportunity to become a fan—or a contender—during your next trip to Fairbanks. The game focuses on strategy, accuracy and teamwork instead of force and strength. Each player throws two stones an “end” (similar to an inning in baseball) while members of his/her team furiously sweep the surface of the ice in the path of the 42-pound granite stone to control its speed and direction. Teams can also knock their opponents stone out of contention. Any curling fan will tell you, once you know the rules you’ll be hooked. It isn’t a contact sport but it’s plenty competitive. This is your chance to enjoy the live atmosphere while watching teams grunt, holler and yell their ‘rock into the house’ to win the title of Junior National Champion. Or if you can’t make it for the championships and want to try your hand against the local competition, drop by the Fairbanks Curling Club next time you’re in town. www.curlfairbanks.org.